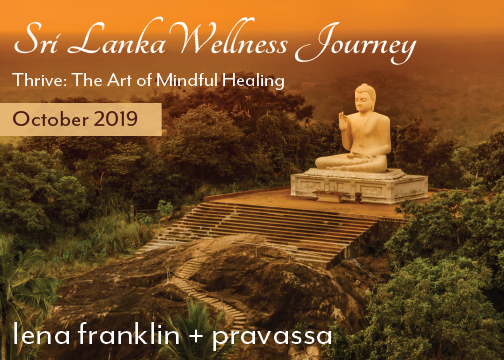 Join Lena Franklin + Pravassa founder Linden Schaffer on this 9-night/10-day wellness vacation that will journey you back to balance through the art of mindfulness, energy work and holistic healing practices. You’ll experience intimate locally run boutique properties with the comforts of luxurious travel and curated meals at locally run properties to fully immerse yourself in the natural beauty of the land + culture. Put self-care at the forefront of your journey with this unique mindful experience. Immerse yourself in the zen serenity of Sri Lanka as we explore Buddhist traditions and Ayurvedic practices. We’ll tap into the innate capacity of our mind, body and spirit to heal from the inside out. To THRIVE is our birthright and this mindfulness vacation will awaken your boundless capacity to live a life of health and happiness. There are limited spots available. Join us, embody the mindful healer in you! This wellness vacation WILL SELL OUT.